Hwasun-gun (county) is adjacent to Gwangju city and is well known as its green area with mountains and clean water where various culture, tourism and leisure facilities are well equipped including the Dolmen Park, a world heritage where over 1,000 year old culture is kept alive, Unjusa Temple, a mystical antique temple keeping the legend of 'thousands of statue of the Buddha and pagoda‘, Ssangbongsa Temple, the place where the Zen sect of Buddhism in Korea first started, hot spring resorts and golf courses, and recreation forest. The 74% of total area is mountain area in Hwasun-gun. And it is covered with mountains. (Mudeungsan Mountain, Anyangsan Mountain, Manyeonsan, Baegasan Mountain at north, Cheonunsan Mountain at center, Yongamsan Mountain at south.) 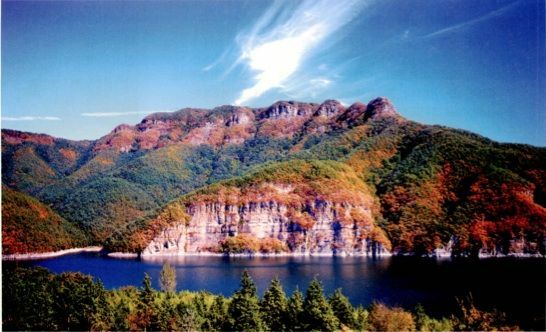 The mysterious scene of Hwasun Red Cliff and Natural Recreation Forests offer good rest area to the tourists. Unjusa Temple is famous for a Thousand Buddhas and a thousand Pagodas. Unjusa Temple is unlike other temples in that it has unusual Buddha statues and pagodas – it is often referred to as a mysterious temple. The Buddhas of Unjusa Temple are different in size and shape. It’s very impressive to see very simple feature with slim shape of faces, simple eyes and mouth, long nose. This type of arrangement and Buddha image producing technique is considered a unique value of the Buddhas of Unjusa Temple, not found anywhere else. What makes the stone pagodas of Unjusa Temple interesting to examine is that they each boats several unique designs and features. The Norumok Cliff was named by prominent scholar, Choi SanDu(Shinjae) who was exiled in 1519. He saw here then he called so because of its similarity in China. After that, so many poets and calligraphers visited and praised the beauty of nature. Hwasun Red Cliff means Norumok Red Cliff. The Muryeom Red Cliff is smaller than the Norumok Cliff. But Muryeomjeong Pavilion which was erected by Song on the hill, JeongSoon possesses a charm of its own across to Muryeom Red Cliff. Bosan Red Cliff is 600 meters away from the Norumok Cliff at north. It’s small but in a great volume of water. Changryang Red Cliff is in Changryang-ri. The height is 40 m and the width is 10m. It gives magnificent feeling. 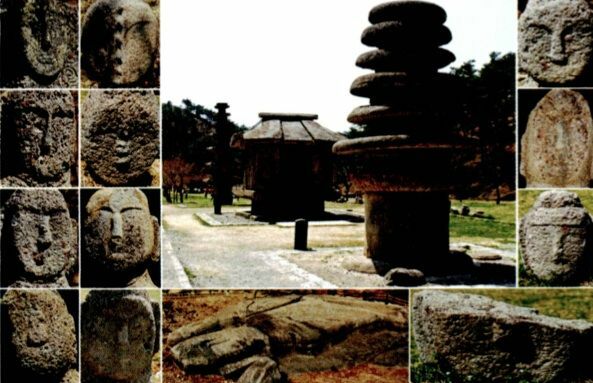 The Hwasun Dolmen Sites distributes whole area of both valleys of hills connecting Hyosan-ri of Dogok-myeon with Daeshin-ri of Chunyang-myeon. It is 4km long, with 596 dolmens. This site is well preserved. It’s natural education site to see how to handle the stones during that time, how to carry the stones at quarry. There are huge stones and the stones buried deep underground, the stones beside valley. It’s easy to see dolmen everywhere. This is the world of Dolmen. It makes the feeling of riding time machine to go back the time. At the same time to walk and see the stones, trees, it’s just beginning of the trip to prehistoric ages. 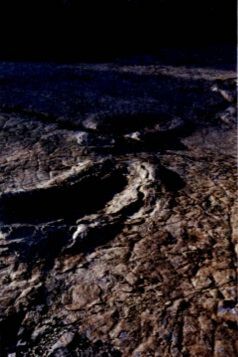 The about 57 footsteps of deinonychosaur have benn seen as unique theropod trackway(Biggest 52 meters) in this area. There are about 1500 various footsteps(Big and middle footstep size of meat-eating dinosaur, and the food steps of herbivorous dinosaurs) observed in the very featured area. It’s unconventional attractions because there are many silicified wood fossils, plant fossils, trace fossils, sun-cracks, ripplemark etc which are well showing sedimentary structure and horizontally sedimentary bedding developed. the beautiful scenery. It’s commonly known that Muryeomjeong (Pavilion) was built by JungSoon, Song "Muryeom" during the reign of King Jungjong of the Joseon Dynasty. Going along Dongbok lake, It’s seen milestone of Muryeomjeong (Pavilion). After that, Strange rocks and Muryeom cliff are waiting you with the pine forest. Muryeom cliff is not higher than Hwasun Red Cliff. 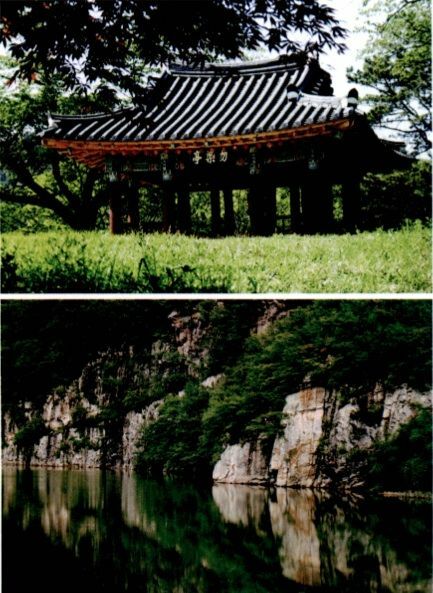 Muryeomjeong (Pavilion) is on the Red Cliff River. Muryeomjeong (Pavilion) is surrounded with other stonewalls. So the scene of the river is picturesque. The Ssangbongsa temple had been built up before 839. Hyecheol spent a summer in Ssangbongsa Temple after returning from Tang (839). Cheolgamsunsa opened the school in here when he came back from Tang(China). The name “Ssangbong” means the twin peaks in front of temple. The Ssangbongsa Temple has Daeungjeon, Geukrakjeon, Jijangjeon Hall and newly restored Yosachae, Cheolgamsunsa pagoda(National Treasure No. 57) and Cheolgamsunsa memorial stone(Treasure No. 170). 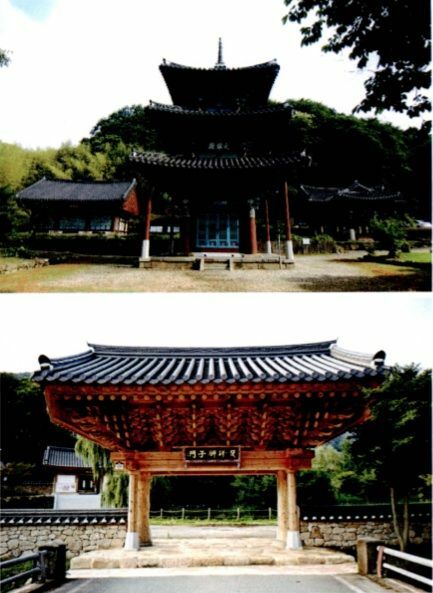 It’s very rare type of wooden pagoda together with Mireukjeon Hall in Geumsansa Temple, Palsangjeon Hall in Beopjusa Temple. The Daeungjeon Hall in the Ssangbongsa Temple was destroyed by fire in 1984 but it is newly constructed. 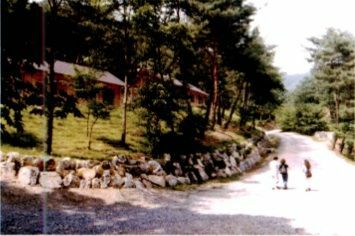 Baegasan Natural Recreation Forest is recreational facilities of donghwaseokgol Valley at the Baegasan Mountain(810m) whose branch ridge covered this area like open-arms toward the south. Baegasan Natural Recreation Forest is well known for the good maintenance of its facilities. 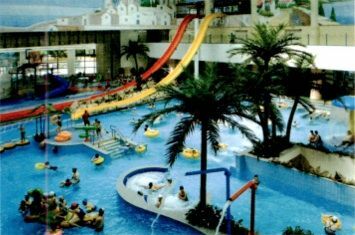 There are family size accommodation and Four Season Sledding Slope in Baegasan Mountain. It is famous for the vacation spot of the Gwangju Metropolitan City. There are fabulous strange rocks and bizarre stones on Baegasan Mountain ridge. And the driving course here(Gwangju-> Mudeungsan Mountain-> Gwangjuho lake-> Soswaewon Garden-> Hwasun Hot Springs) is the best also. There is Solutional cave near the entrance. When you reach the observatory in Palgakjeong (Octagonal Pavilion), you can feel the happiness to get the peak and you can also see the Jirisan Mountain, Wolchulsan Mountain, Jogyesan Mountain, Mohusan Mountain etc. Tourist spot of Hwasunoncheon Hot Spring is located at the whole area of Ok-ri and Seoyou-ri, Buk-myeon, Hwasun-gun. It’s first found along Honam area. And the Spring is radium hot spring with 5 essential minerals for the Human. It’s good for the acceleration growth for the kid, prevention of hair loss, promotion of vigor, skin disease. Tourist spot of Dogokoncheon Hot Spring is located at the whole area of Cheonam-ri and Wonhwa-ri, Dogok-myeon, Hwasun-gun, Jeollanam-do. The spring from 600m underground is highly effective for various skin disease . There are 60 restaurants around the spot. And there is also Unjusa Temple near.